Whether you've been invited to a wedding where there will be dancing afterward, or you've decided to take up ballroom dance as a new pastime, it's important to learn the ropes. Knowing the steps is only a small part of being a ballroom dancer. You also need to have proper etiquette, which includes knowing what to wear and how to behave on the dance floor. As TV shows “Dancing with the Stars” and “So You Think You Can Dance” have developed a broad audience, ballroom dance has gained popularity. Dance is one of those activities that require social skills, and with those, you’ll need to learn the proper rules of etiquette. Guys, the girls will love seeing you show off good manners, and ladies, the men will appreciate having someone show them how to behave on the dance floor. Learn the basic rules of proper etiquette that apply to all areas of life. If you know these, you are ahead of almost everyone else. Remember that everyone has a better time when the guidelines are followed. Make sure you take a shower, brush your teeth, and have breath mints. You will be in close quarters, and you don’t want people holding their breath when they are around you. Use a deodorant that is strong enough to last as long as you’ll be dancing. Avoid smoking if possible. If you must have a cigarette, go outside, but before you go back in, pop a breath mint. Remember that the smells will linger on your clothing and in your hair. Before you go to the dance, find out what the dress code is. You don’t want to show up in jeans to a white tie affair. Make sure you are wearing comfortable shoes since you will be on your feet most of the time, but don't wear sneakers. 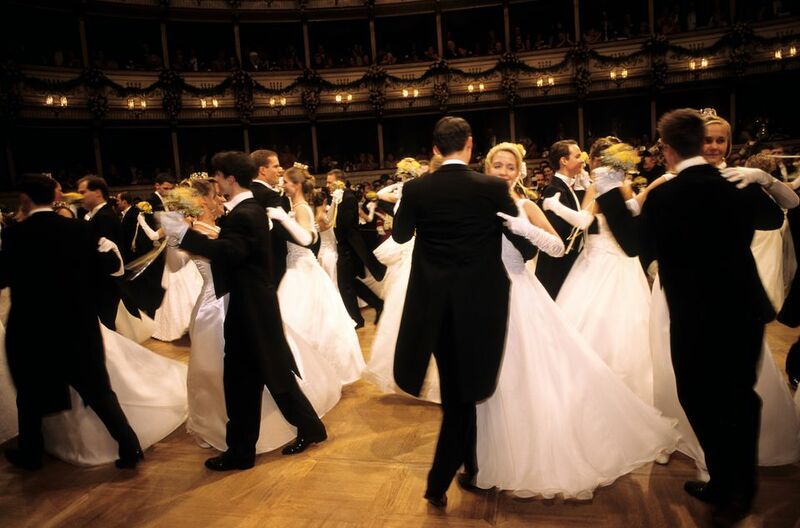 On most ballroom floors, you will be expected to move in a counter-clockwise direction. If everyone complies, you aren’t as likely to bump into another couple. However, if you do, smile and apologize. This is not the place to have a chip on your shoulder and start a fight. Even if everyone moves in the same direction, you’ll have accidents. If you have a temper, practice apologizing and saying, "Excuse me," before you leave your house so you won’t embarrass your partner or the other couple when it happens on the floor. If you are a slow dancer, edge toward the center of the floor and leave the outer rim to the faster dancers. However, don’t go to the very center. That space is reserved for those who enjoy practicing fancier or more advanced steps. Remember that everyone makes mistakes, and awkward moments happen. Try not to step on anyone else’s toes but have a good attitude if it happens. Smile, make a quick apology and move on. Never accuse the other person of always being at fault. This makes you seem like an arrogant know-it-all. In ballroom dance, it doesn’t matter who asks for the dance. It is perfectly acceptable for the man or the woman to approach the other. You don’t have to stay with your date either. Most dancers enjoy a variety of partners on the dance floor, so have an agreement with your date about how frequently you’ll dance with others. Use appropriate language to ask someone to dance. Avoid using cheesy pickup lines at a ballroom event. Would you like to waltz? When you attend a ballroom dance, it’s generally good form to accept a dance with anyone who asks unless you have a very good reason not to. If you have already promised the dance to someone else, you are thirsty, you need to catch your breath from the last dance, or your foot is swelling, the person asking will understand. If you ask someone to dance, and he or she declines, smile and say, “Thank you. Maybe later.” Don’t be afraid to ask again. However, if you are turned down three times in one evening, graciously take the hint and don’t ask that person again. After the dance is over, thank the other person and applaud all the dancers. The man should walk the woman back to where she was before the dance started, even if she asked him to dance unless she requests otherwise. Acknowledge other people’s accomplishments. Praise your partner or another couple for executing a complicated ballroom step. If there is a competition, congratulate the winning couple.